It's just a bit of eczema. I find myself saying that a lot. It's that childhood skin condition that some never grow out of. Yet you've spent your childhood being fobbed off, being told that it's 'just a bit of eczema, you'll grow out of it', and then you don't. Just a bit of eczema. Just the constant, infuriating, frustrating, burning, insatiable itch that will never be scratched. The itch that starts off small, but if you give in and start scratching, the itch spreads and before you know it you want to rip all your clothes off and scratch and scratch and scratch your entire body, in a hot, frustrated mess, with an itch that will never be satisfied. A scratch that is never vast enough, never deep enough, where your finger nails dig and dig and dig to get to the bottom of that itch that can never be scratched. Just a bit of eczema that leaves you lying awake at night, trying not to move, for if you brush your skin against those soft cotton sheets, you might set off the itch, the itch that can't be scratched. Just a bit of eczema that leaves you scared to go to sleep, because you might end up writhing around in an itchy dream, covering your sheets in your dead skin cells, waking your husband in your hot, frustrated mess. Then you wake in the morning, your nails stained with blood, unable to move your joints which are now covered in scabs. Just a bit of eczema, that renders you a rubbish housewife. Unable to keep on top of the house that's meant to be a home. Unable to wash dishes. Unable to dust, whilst knowing that dusting is the answer. Getting rid of the dust would help, but it would also cause your knuckles to crack and bleed and your skin to bubble with infection. Just a bit of eczema. making you the boring parent. The one who can't splash in the bath, the one who can't take them swimming, the one who can't play in the long grass. Just a bit of eczema, which makes you the awkward guest. The one who always brings her own milk, starves herself through buffets with a smile, insists on avoiding pizza restaurants and then asks to analyse the menu before ordering, checking for milk in the most unlikely of places. Just a bit of eczema that affects your ability to concentrate. When you nod and smile and ooh and aah in all the right places but if you looked behind the eyes you'd realise, I'm just desperately concentrating on not scratching. On not subjecting you to the blood thirsty horror of the scratch. The scratch that will never scratch the itch that always needs to be scratched. It's just a bit of eczema. A bit of eczema that fills your cupboards with disgusting, gloopy creams, none of which serve their purpose, none of which contain the cure to the itch that can't be scratched. A bit of eczema that forces you to crank up the shower because somehow the itch can be burnt off your skin with scalding water, only bringing light relief for a short while before it creeps back over your hands and then your arms, like some kind of horror story alien taking you hostage in your own skin. It's the bit of eczema that as your smiling, drying your hands on a tea towel, you end up wringing your hands really hard underneath the cloth in a bid to remove every trace of water and destroy the itch with it. When your hands emerge they are flaky hot and raw so you run them under cold water to cool and soothe, whilst beginning the vicious cycle again. Just a bit of eczema that bleeds and weeps, that cannot be seen and yet your attempts to hide it leave you more itchy than ever. It causes you to dread the dampness of winter and the humidity of summer. It makes you cover up, yet the dry air is the one thing that might make it better if our British weather system would ever oblige. Just the eczema that drives you to tears as you realise there's an occasion on the horizon which might require you to smile in photographs, but you know, you know that your face will not clear, it will not be better and you step up your moisturising, you step up your medication in the desperate hope that you might, you just might, be able to wear make-up that day. That is if the foundation doesn't stick to the awful flaky mess that is your face. Just a bit of eczema that makes you check your calendar for any social events where you might need your confidence before taking any new medication or risking your skin on a potential allergy buffet, or even, say, cleaning your house. It's the eczema that, whilst others flick through magazines, or check their phones, makes you absentmindedly pick the scabs off your hands to try and achieve the holy grail of smooth. It's just the eczema that's always there. On bad weeks it's visible for all to see and for me to feel. On good weeks, it's in my mind, affecting everything I do, the fear of a flare up preventing me from living fully and freely. It lies in wait, ready to pounce, ready to steal my confidence on days when I need it most. It creeps up, nothing major, just a bit of eczema, crawling over the surface of my skin until I look down and suddenly I'm broken and weeping, red raw, exhausted. It's stolen my sleep, my self-esteem, my confidence, my joy, my abilities to parent, clean, concentrate, engage. But it's just a bit of eczema. It's National Eczema Week. 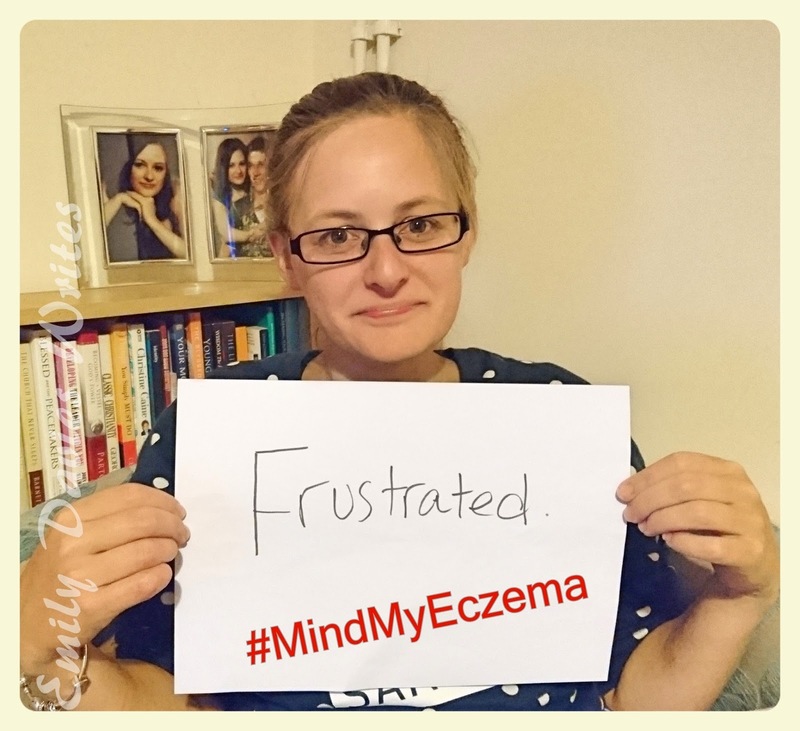 This year as part of the Mind My Eczema campaign, The National Eczema Society is focusing on the psychological and emotional impact of eczema, encouraging people to remember the person as well as the skin. This isn't me all the time, in fact a lot of these feelings are thankfully a rarity nowadays. But I still live in fear of flare ups and plan my life around preventing them - which does have a psychological and emotional impact. Eczema makes me feel frustrated - can you tell? !